LeBron James isn't on the list. Kevin Durant, Carmelo Anthony and Kobe Bryant aren't here, either. Not one player from last year's gold medal-winning team in London. Players like Indiana's Paul George, Cleveland's Kyrie Irving, Portland's Damian Lillard and Washington's John Wall will be among those taking part in the camp. Jerry Colangelo and Mike Krzyzewski arrived in Las Vegas with a group of 28 players ready to participate in a four-day camp that will mark the beginning of preparations for next summer's World Cup in Madrid. And that is exactly how they planned it. This camp, which is scheduled to begin on Monday, is geared toward bringing some fresh faces into the mix. As Colangelo, the managing director of USA Basketball, likes to put it, it's all about keeping the pipeline filled. "There should be turnover each competition because then the young players can see that happening," Colangelo said Sunday night. "They can say, 'If I progress as a player and if I'm part of this program and culture, I'll have a chance to compete.'" Players like Indiana's Paul George, Cleveland's Kyrie Irving, Portland's Damian Lillard and Washington's John Wall will be among those taking part in the camp. New Orleans forward Anthony Davis, who played sparingly for Team USA last summer, is the only player with Olympic experience on the roster. But the United States isn't competing in any tournaments this summer. The gold medal James and Co. won last year made them automatic qualifiers for the World Cup next summer. So Colangelo and Krzyzewski have plenty of time to shape the roster. Even though none of the leaders from London are in Vegas this week, Colangelo still believes there is a good chance some will be with the team in Spain. Back in 2010, Team USA took a completely different roster to the world championships in Spain than the one that restored the Americans' place atop the basketball world at the Beijing Olympics in 2008. Durant emerged from that group of 12 new players to lead the team to the title, but Colangelo thinks next year's squad will be more of a blend between old faces and new. He said he's received encouraging signs that Durant, Russell Westbrook, James Harden and Kevin Love all want to play next summer. "The key, as far as I'm concerned, going forward for '14 is if Kevin Durant is willing to play," Colangelo said. "We've heard some indications that he wants to. We know that Westbrook would love to. We've heard the same about Kevin Love. Harden is another. If we have three or four of those commitments, that's a third or quarter of our roster." Colangelo certainly won't rush those stars to make a commitment, just like he didn't push Krzyzewski, who surprised some by announcing his decision to come back for another four years as coach. On Sunday, both seemed energized by the new faces on the roster, and on the coaching staff. This week will as much be about getting acquainted with new assistant coaches Tom Thibodeau and Monty Williams as it will be about working with all the new players in town. Krzyzewski had crossed paths with Williams, a friend of former Blue Devil Grant Hill, on occasion and has admired Thibodeau from afar for years. But this week will be the first time all three will work closely together, which is why Krzyzewski wanted his staff to run the camp. In the past, another set of coaches has occasionally been brought in to conduct the practices while the Team USA staff observed. "I felt it was necessary for us to see the players and get to know one another and work with each other," Krzyzewski said. "And it's worked out, even in the 24 hours since we've been together. ... I'm excited. These guys are good guys. I mean really good guys. They have new perspectives. So it will be good." Colangelo remembers the freshness of that world championships run in 2010, and expects to feel a similar new energy from players in camp this week. Indiana Pacers point guard George Hill had to pull out because of a scheduling conflict and Chicago forward Taj Gibson and San Antonio swingman Kawhi Leonard won't participate because of injuries. But the team still has 28 players to look at, a testament to the standing of the program. It wasn't long ago that the Americans were coming off a humbling loss in the 2004 Athens Games, with many players reluctant to sign up for duty. Colangelo was brought in to change all that, and he has. 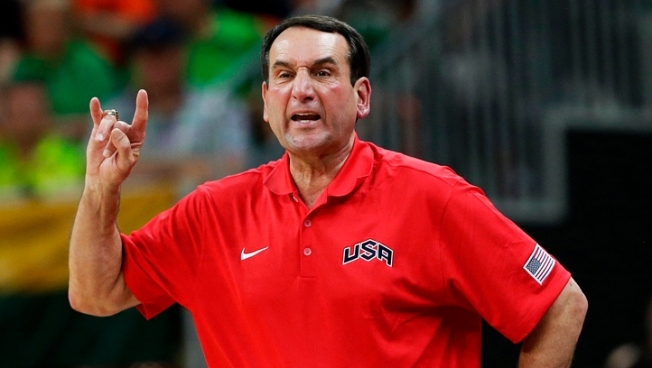 "People want to be with USA Basketball," Krzyzewski said. "They should. But for a while there, they didn't. It enjoys now, primarily because of Jerry's leadership, a really high status, which we need to maintain. You're not just given that status. You have to earn it."